After shocking the airwaves with its HD1BT525 Harley-Davidson Replacement stereo package, ASA Electronics has upped its game by adding over an inch of booming sound with all-new 6.5” speakers. 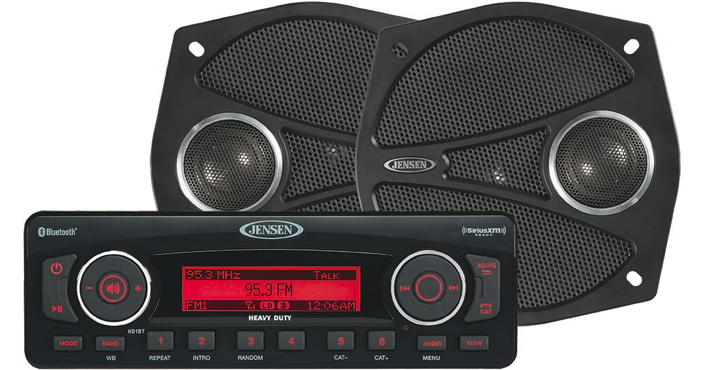 This JENSEN Power Sports audio kit, named HD1BT650, still features the true plug n’ play design, allowing for both the stereo and speakers to fit into the factory fairings opening with ease. A 5.25” speaker can only reproduce so much bass, you need more cone area to produce more bass. The larger 6.5” speaker allows for deeper sound and the included adaptor rings make it possible to shoehorn in a 6.5” speaker into a fairing originally designed to handle a 5.25” speaker. Combine those speakers with the already incredible HD1BT stereo, which features Bluetooth, Sirius XM capabilities and a USB port, and get one awesome package of in-your-face beauty. It doesn’t only sound excellent, but it is aesthetically built to look great installed on a Harley.